Residents in Worcestershire towns cut off by flood waters since the weekend are starting a clear-up operation. The Environment Agency says it will take down flood defences in Bewdley on Wednesday, as water levels fall. Traffic is returning to the streets but some roads remain closed. In Worcester, which was also cut off, most roads have reopened except Hylton Road. Meanwhile, more than 5,200 Herefordshire residents are urged to boil their water until further notice. People living in and around Bromyard were told on Monday to boil their water for the next 48 hours after a treatment plant near Worcester was affected by flooding. However, Welsh Water has now extended this, saying they should boil water until further notice. In Great Malvern, the Somerfield supermarket is rationing the number of pints of milk customers can buy, to six. Manager Nicki Watkins said: "We missed just one delivery on Saturday and supplies ran out very quickly. "I think people became concerned so when a delivery came on Monday I think people reacted and started to buy a lot more than they needed to." 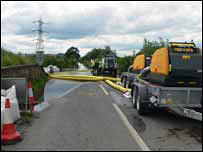 The fire service started pumping water out of the Herefordshire village of Hampton Bishop on Tuesday afternoon. About 130 people were evacuated from the village over the weekend after the River Lugg breached flood defences. The council said the river has been at its highest recorded level and the water cannot escape back into the nearby River Wye because it is also flooded. Regional development agency Advantage West Midlands has announced an extra £1m of flood aid to be distributed across five areas of the West Midlands. Malvern Hills and Wychavon in Worcestershire will receive a share along with South Shropshire, Stratford-upon-Avon and Bridgnorth. A severe flood warning remains on the River Severn between Worcester and Tewkesbury, including Upton-on-Severn and Kempsey. A spokesperson for Worcestershire County Council said people can travel into Upton on some routes, but the major bridge into the town is still closed. She said: "Things have dramatically improved. "All of the rest centres are closed now, but they're on stand by in case we have another emergency." The Environment Agency will be conducting an inquiry into problems with temporary flood barriers at the town. The barriers are stored at a secret location because of their high scrap value and were 30 miles (48.3km) away when the flood waters arrived. The agency said even if they had been in place, the water would have topped them. Paul Lockhart, a flood risk manager at the Environment Agency, said the situation near Worcester was improving. He said: "At the moment most of our levels are falling - in Worcester, the levels are falling, Tenbury, Knightsbridge Bransford - all the way down the corridor the levels are falling, which is fantastic news really."